Bonn – With its headquarters in Bonn, Germany, healthbase is the latest and newest initiative in the blockchain and healthcare sector aiming to advance and revolutionize medical research. You may also be interested on Bitcoin. Healthbase seeks to leverage the core aspects of blockchain technology and advanced information technology to promote medical research and healthcare itself to the next level. The broader aim of the project is to ensure that medical researchers, care providers, as well as patients, are given easy and secure access to high-quality health data. Progress in the field of medicine and better therapies for patients are the results of this. “the current infrastructure handling patient medical records and supporting therapies is composed of legacy systems that we believe are no longer sufficient to meet the growing demands of the burgeoning medical industry in today’s age. Health data is currently scattered across a myriad of platforms, thereby preventing holistic care while raising serious privacy and security concerns. Which is why we decided to come up with “healthbase” that aims to leverage modern information technology including blockchain to improve this status quo. While there might be other projects focusing on improving certain aspects of the healthcare sector, our USP lies in the fact that we have a very feasible way of transforming the whole situation. Currently, we have over 90 employees, including 32 doctors in our clinics; and because we also develop our software for doctors to implement optimized processes, we can fine tune our project with the direct feedback we receive from the care providers as well as our patients”. 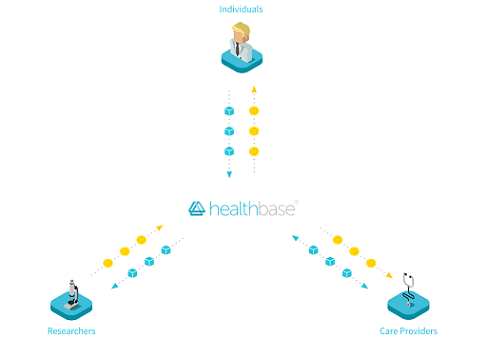 After beginning to develop the software almost three years ago, healthbase is currently creating a white paper and developing a prototype to incorporate blockchain technology. While the core team of healthbase is in Bonn (Germany), the project has international advisors, and partners spread across the globe, and is continuing to grow, given its potential to redefine the healthcare industry. The team behind healthbase aims to launch their ICO next year in the first quarter of 2018 with a working prototype. While the technical details concerning the type of blockchain and token structure are still in active development, the project has already generated substantial interest among the medical and blockchain communities in Germany.